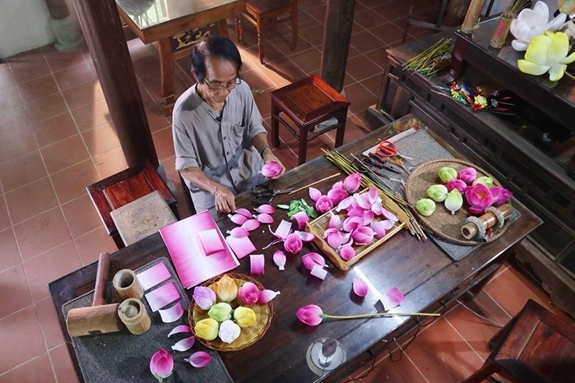 HÀ NỘI — A space for artisans from across the country to showcase their products and skills is the highlight will be the eighth Huế Traditional Craft Festival from April 26 to May 2. Various trades will be featured including embroidery, bronze casting, Zèng textiles, paper flowers, sewing, essential oils, lion dancing and pottery. The organisers confirmed the festival would have the participation of 350 artisans from famous craft villages nationwide and 17 international delegations from 11 countries such as South Korea, China, Japan, Brazil and Turkey. “This is an opportunity for artisans to show their talents and the quintessence of Vietnamese traditional crafts,” said Nguyễn Văn Thành, head of the organising board. The festival will bring together various programmes such as exhibitions and introducing traditional products of domestic and foreign traditional crafts; the rite to commemorate the patrons of all crafts; the procession honoring artisans and craft villages; áo dài fashion show with designs by Minh Hạnh, Diego Cortizas from Chula brand, Ngọc Hân and Hà Duy; and a gastronomy festival. The Fiesta “Colours of Childhood” will take place at the Huế Children’s Cultural House, 8 Lê Lợi Street. It will feature music concerts and other community activities to inspire children to be proud of their traditional crafts and cultural heritages. A Hot Air Balloon Festival showcasing performances from Việt Nam, the Netherlands, Thailand, Japan and Malaysia will be held on April 27-29 at Hàm Nghi Court.